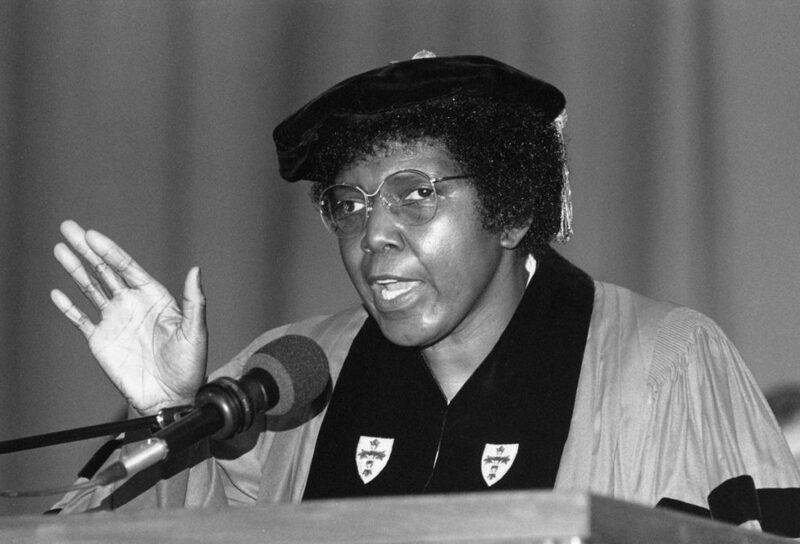 In celebration of Black History Month, we remember Barbara Jordan’s 1987 Commencement address at Middlebury. She received an Honorary Doctor of Laws and spoke about values in education and those which members of society should agree to live by: Truth, Tolerance, Respect, and Community. 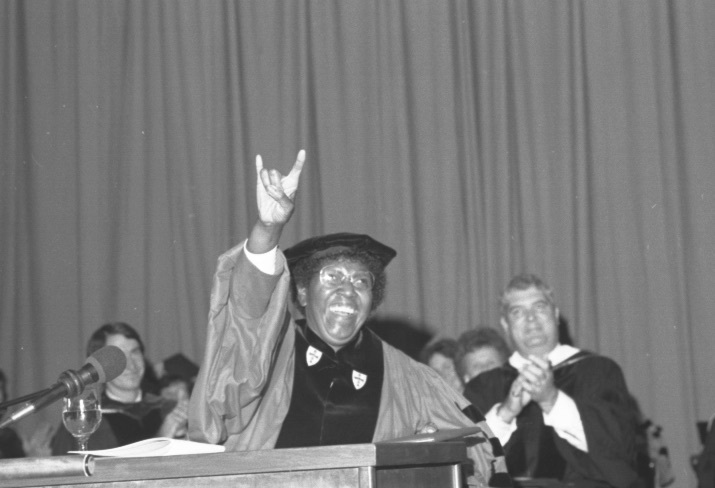 The former congresswoman showed her Texas pride from the commencement podium with the University of Texas’s “hook ’em horns” hand symbol. After retiring from politics in 1979, she taught ethics at the University of Texas until her death in 1996. Born in Houston, Texas exactly 81 years ago, Jordan earned her law degree from Boston University in 1959 and was elected to the Texas Senate in 1966, becoming the first African-American state senator since 1883 and the first black woman to hold the seat. In 1972, she was elected to the U.S. House of Representatives, making her the first woman to represent Texas in the House, and (in the same year) as president pro tempore of the Texas senate, the first black woman in America to preside over a legislative body. She extended her rhetorical capabilities to Middlebury College in 1987, undeterred by the multiple sclerosis that would ultimately kill her, delivering the address from a wheelchair. Source: “Jordan, Barbara Charline | US House of Representatives: History, Art & Archives.” Accessed February 21, 2017. http://history.house.gov/People/Detail/16031. While we love the entirety of this video by our local Middlebury filmmakers (we’re talking to you, Demetrius Borge ’16, and Chris Spencer), our hands-down favorite clip in their recent piece J-term Scenes: Tell Us What You’re Most Excited About (featured below) has to be minute 1:16, featuring our very own postgraduate Fellow in Special Collections & Archives, Mikaela Taylor. Read it on Archive-It’s blog or below! 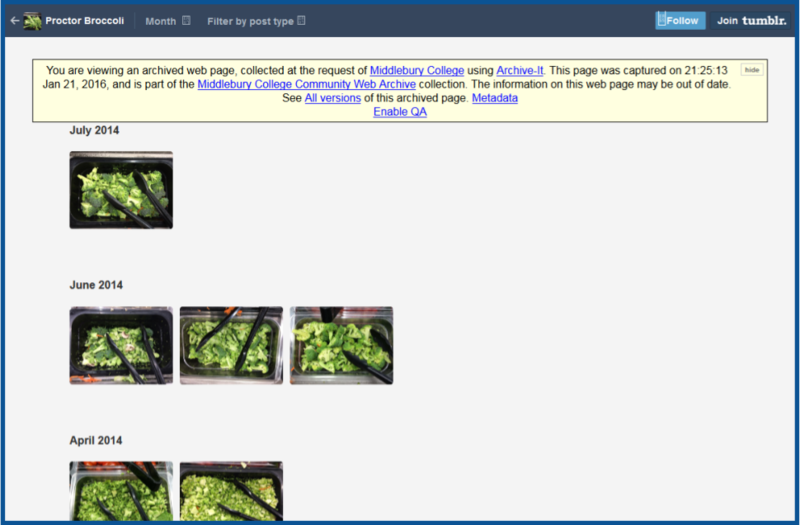 The following is a guest post by Patrick Wallace, Digital Projects & Archives Librarian at Middlebury College. In November 2015, as I stepped into my position as Middlebury College’s first digital archivist, our Director of Special Collections approached me for ideas on how to begin work toward three mutual goals: providing boldly promiscuous, public access to our digital collections; preserving born-digital and web content; and, including fuller representations of student life in the college archives. Like many institutions, Middlebury’s previous efforts to preserve institutional memory emphasized – at least implicitly – the authorized, public face of the college: official publications, administrative business, sanctioned student activities, and so on. The college archives therefore represented a mostly sanitized view of campus culture, a clean and uncontroversial history that we in Special Collections found unacceptable at a time when student protests over issues of discrimination, violence, gender and sexual identity, racial diversity, and a host of critical social justice issues were shaking up campuses nationwide, and as Middlebury was making conscious institutional efforts to improve on-campus diversity, inclusivity, and community wellness. Subsequently, our first major initiative toward change was the Middlebury College Community Web Archive, which began, and remains, a central effort by the college archives toward constructing a more just institutional memory. 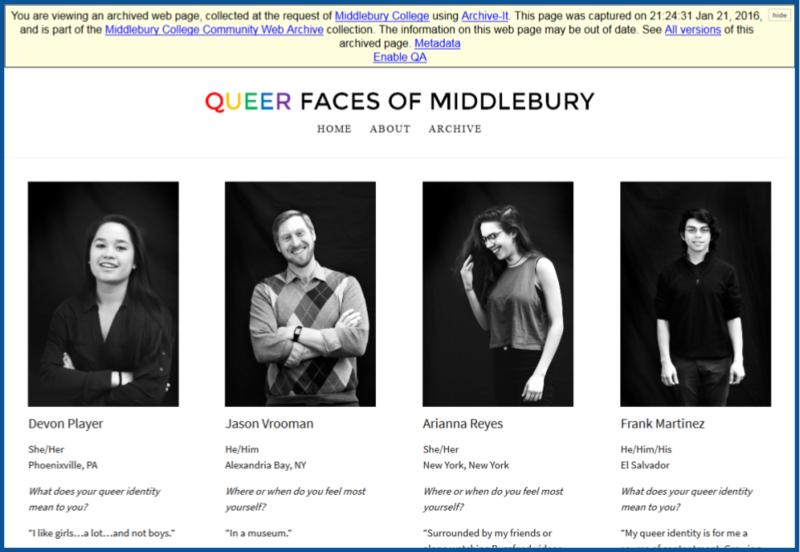 Queer Faces of Middlebury, a student-created photographic narrative documenting diversity among students, staff, and faculty. A major goal of the project has been to capture and preserve discussions happening in Middlebury’s culturally diverse activist margins. 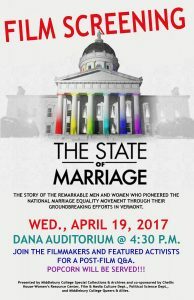 Student debate and activism happens in large part online, especially via Facebook, Twitter, WordPress, Tumblr, and other social media outlets. Students often speak more freely in these virtual spaces than they might, for example, in the editorial pages of the college’s newspaper or in an institutionally-sanctioned town hall discussion. As a long time fan, I had been suggesting that the Internet Archive would play a central role in our digital collections strategy from the time of my job interview, and the ideas behind the Community Web Archive delivered a perfect justification for partnering with Archive-It. Identifying and collecting student-created content from unsanctioned online sources (e.g. sites outside of our institutional web domain, or social media feeds from organizations unaffiliated with the college) was a clear priority, but not without a host of risks and difficult choices: we had concerns about unfairly appropriating student voices for our own work; we wrung our hands over how to organize potentially controversial materials; we discussed concerns about administrative pushback; we worried about inspiring resentment or mistrust in students who were critical of the establishment to which we in the archives are certainly beholden. As archivists and curators, we have immense power to shape history. It is my decided opinion that participating in the soft censorship of omission in deference to a personal fear of backlash is grossly unethical. Therefore, the famous words of computing pioneer Grace Hopper–“it is easier to ask for forgiveness than to get permission”–have been a central guiding principle of our digital collections strategy. Image from a student created “disorientation guide” questioning institutional efforts at improving campus diversity (disorientmidd.wordpress.com). 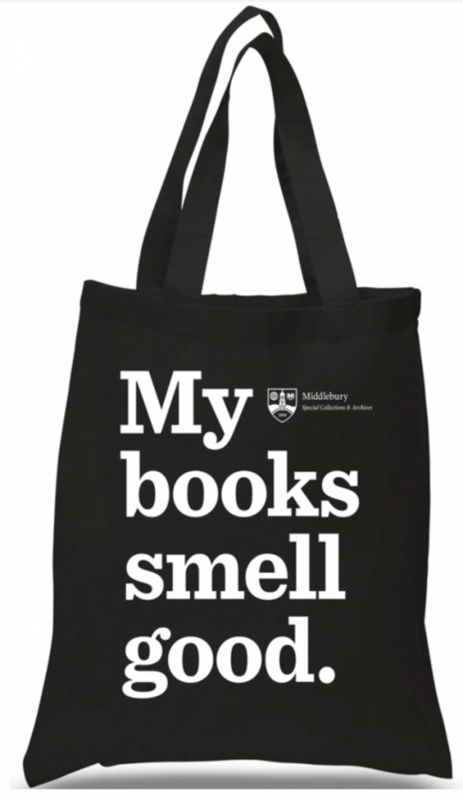 Yet, the archives are also an institutional authority, and when our artifacts represent voices set in opposition to that same authority, it is imperative that we remain sensitive to the risk of exploiting or misrepresenting student experiences in our collections. Organization and definition presented an immediate challenge. YouTube channels by Middlebury’s acapella singing groups could certainly live comfortably and uncontroversially alongside the Mountain Club’s Facebook account. But what about a pseudonymous student’s blog post about the failed and traumatic institutional response to their sexual assault? What about an environmentalist polemic that cast Middlebury – the first school in the country to offer an undergraduate degree in environmental studies – and its administration in a less than favorable light? What about the website of a satirical publication that, while venerable on campus, is run independently of the college? To answer the question of classification, I proposed that we turn to our original goal – to provide a full and honest view of student life – and make the choice not to impose artificial distinctions. Theater and mountaineering have long been a part of the “college experience” at Middlebury, but so have sexual violence and racial discrimination; to suggest otherwise would be fundamentally disingenuous and contrary to our aims. We reached out informally to a number of students and recent graduates, and encouraged them to speak with their peers in turn; all agreed that a boldly inclusive collection was the best solution. To be honest, I still do not know if this is a representative view among the student body, much less among the administration. However, I firmly believe that the Middlebury College Community Web Archive is the most radical, candid, and diverse sampling of student voices ever collected by the college archives. Documenting broccoli served in a Middlebury College dining hall (proc-broc.tumblr.com). Another key question was how to identify URLs for preservation, and do so in a way that allowed student participation in the curatorial process. An initial set of seeds was proposed by our Special Collections’ postgraduate fellow, Mikaela Taylor, a recent graduate who was aware of popular student publications and activities that might escape the attention of other library staff. However, we did not want all of the curatorial decision making to come from within the archives. We set up a Drupal form for URL submission linked from the library website, and Mikaela led promotional efforts encouraging students to submit their favorite websites, blogs, and social media feeds. The form is designed to be simple; aside from the site URL and a field for descriptive information, the form asks simply if the submitter has rights to the site content, and if not, whether or not they know who does. 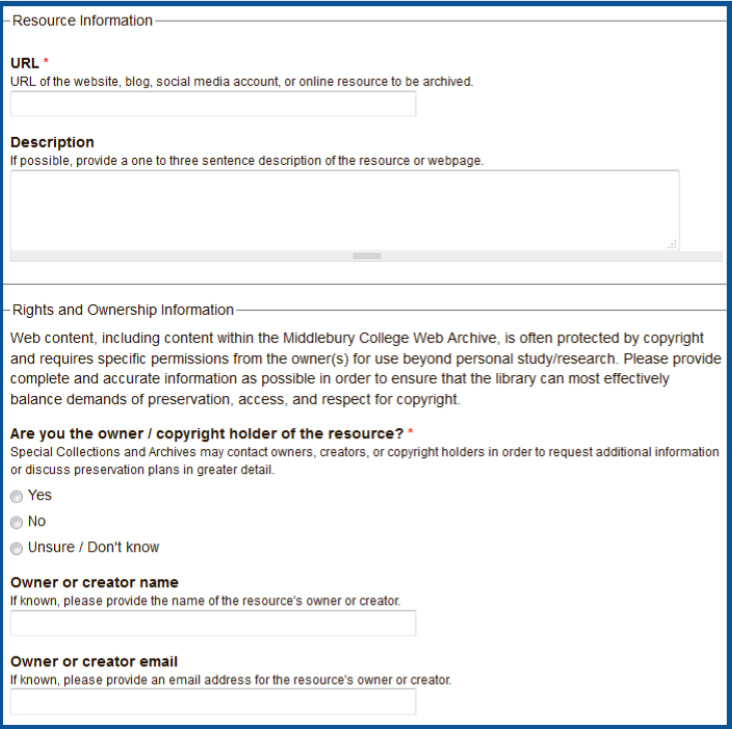 As a rule, if a URL is submitted by a Middlebury community member, it is included in the archive; we have chosen not to crawl perhaps half a dozen because their size or document count was more than our Archive-It subscription can currently accommodate. One of our notable promotion campaigns came at the end of the spring semester, when graduating seniors traditionally post “crush lists” – creative posters listing platonic or romantic crushes from their college years – in common areas. A mock crush list created by Special Collections listed some of our favorite sites included in the web archive, with links to the submission form. The response was good, and provided URLs for several sites now in the collection. When facilities management began taking down the crush lists, students began posting scans and photographs to Tumblr; the site URL was submitted to the archives and added as a seed. Out of over a hundred seeds being crawled, only the crush lists site has been kept out of the public archive, because of concerns over privacy. 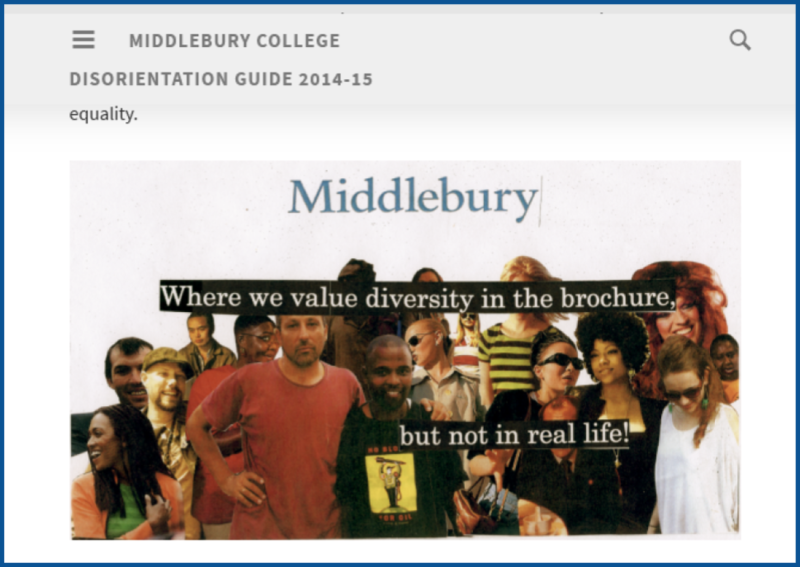 Middlebury’s URL submission form for students & faculty. Work on the archive continues, and we are adding more seeds while actively developing workflows to bring WARC files from Archive-It into our nascent institutional repository. As I write this, the Middlebury College Community Web Archive contains 138 seeds (97 public) totalling over 53GB of data and a million documents, with an incredibly broad range of content: a collection of animated GIFs lampooning the college experience at Middlebury; local news articles about racist attacks carried out against a student government candidate via YikYak; blogs by students studying abroad that focus on cheese and textiles in different countries; Facebook pages representing Middlebury’s Black Student Union, LGBTQ+ activist groups, local musical acts, theater troupes, and fossil fuel divestment initiatives. Adding descriptive metadata remains a work in progress, but more than half of the public seeds include fairly rich descriptive information. Submissions keep coming in and our promotional efforts have not abated. We are proud of the work our partnership with Archive-it has facilitated, and certainly hope our collections provide future researchers, students, and alumni with as much fascination and insight as we in Middlebury College’s Special Collections and Archives have gained through their development. Middlebury’s Bread Loaf campus is usually seen as a peaceful academic retreat nestled in the lush landscape of the Green Mountains, but 75 years ago, it was briefly home to a serious display of military might. College President Paul Moody (who had served in World War I and was a member of the National Guard) hosted the 754th Tank Battalion at the campus in the fall of 1941. This compilation of footage from 16mm reels in the College archives are believed to show the visit, including a shot of a helmeted President Moody in one of the battalion’s vehicles (an unused title card on another reel in the archives reads: “Prexy Gets Tanked”). 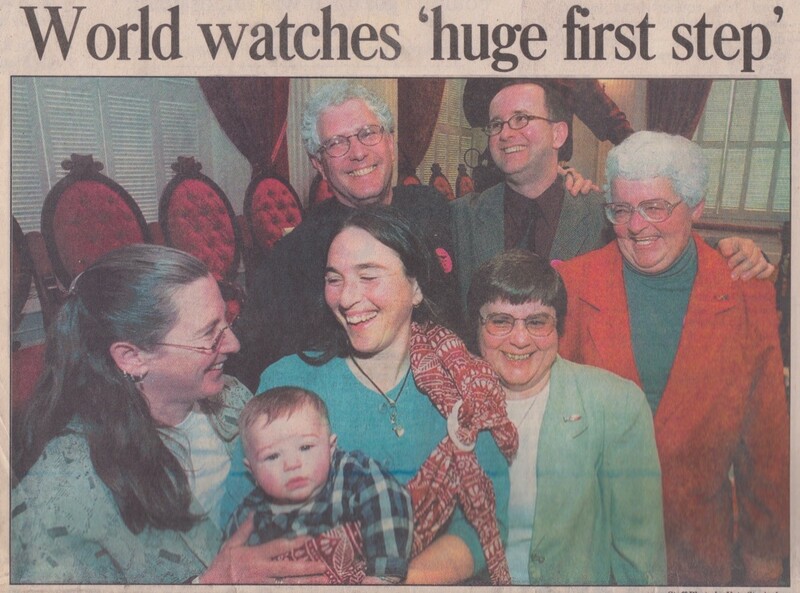 Other footage includes author and professor William Hazlett Upson with an unknown child dressed as a soldier, officers visiting the Middlebury Inn, and a procession of military vehicles through campus. 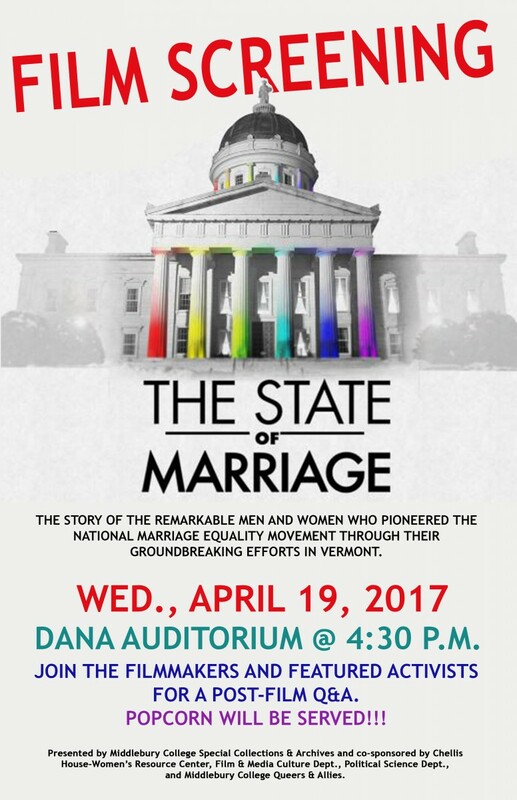 For more information or for permission to use this clip contact SpecialCollections@middlebury.edu. Compilation from original 16mm films in the Middlebury College Archives. 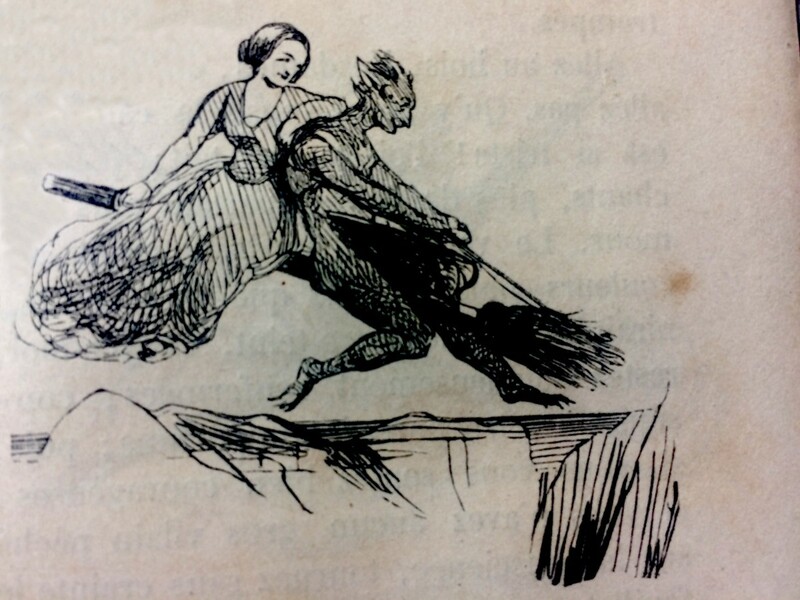 According to this little Parisian book, stored in Special Collections and published in 1842, there are many kinds of devils: the cuckold (diable cornard); the “love devil” (diable amoureux); the wicked devil (méchant diable) and so on. 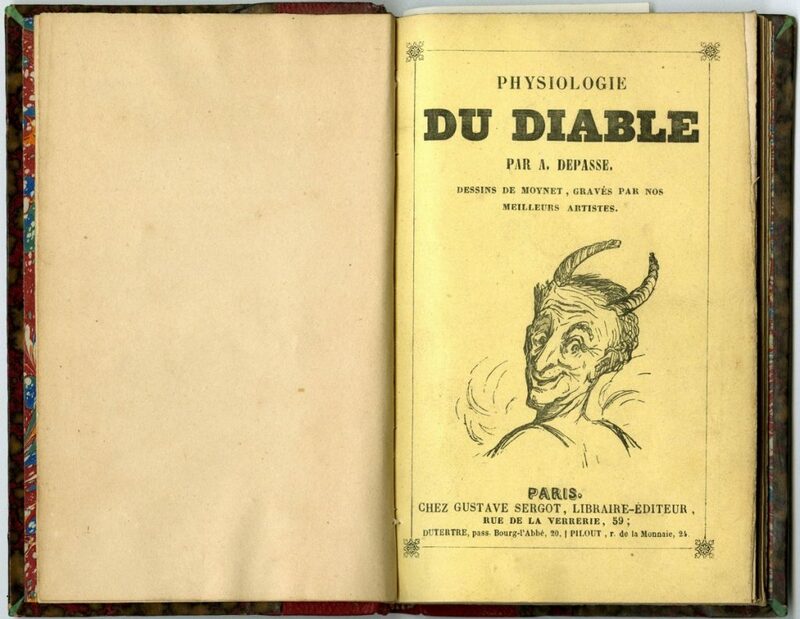 The book, titled Physiologie du diable with drawings by the “best artists” seemed perfect to us for celebrating Halloween. For one, it debunks the idea that only witches ride broomsticks. At least in Paris, in the 19th century, devils took over that role and grabbed hold of the broom. Happy Halloween, from all of our devils to yours. “…vous êtes trop jolies pour monter à califourchon sur vieux manche à balai.” (…you’re too pretty to ride astride a broomstick.) From p. 7, Physiologie de Diable, 1842. 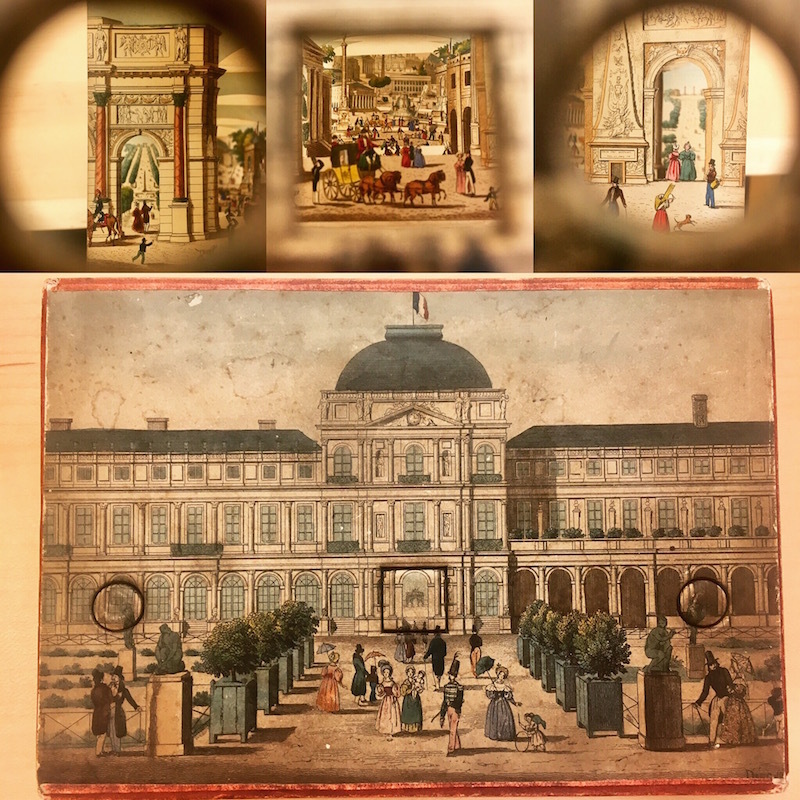 This guest post is by Sam Cartwright, ’18, student employee of Special Collections & Archives. The early history of photography is filled with laborious, finicky processes as idiosyncratic as the tinkerers who blended art and science to invent them. There’s the daguerreotype, the first and most otherworldly of the bunch which requires viewing its mirrored metal surface at an angle — and developing it with poisonous mercury fumes. There’s the calotype, a painterly reflection of reality imprinted directly onto paper not unlike the cyanotype, a dreamy blue-tinted print. And then there’s wet-plate collodion. 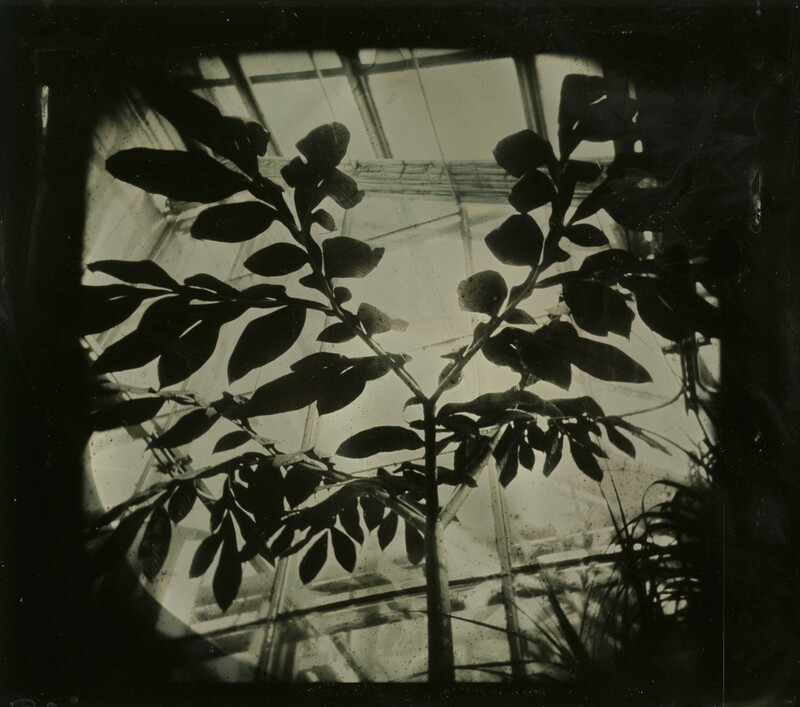 By making a thin layer of collodion (the syrupy result of dissolving guncotton in ether and alcohol) light sensitive then exposing and developing it before it dries, an image can be made onto metal or glass. 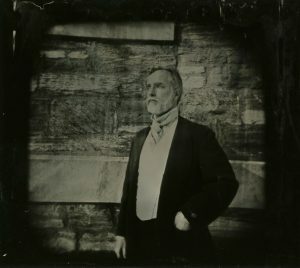 Early metal plates used in the process were made out of tin, begetting the fitting “tintype” moniker that quickly became a misnomer once iron plates were adopted as a superior substrate. The wet-plate collodion process was introduced to the world in 1851 by Frederick Scott Archer. 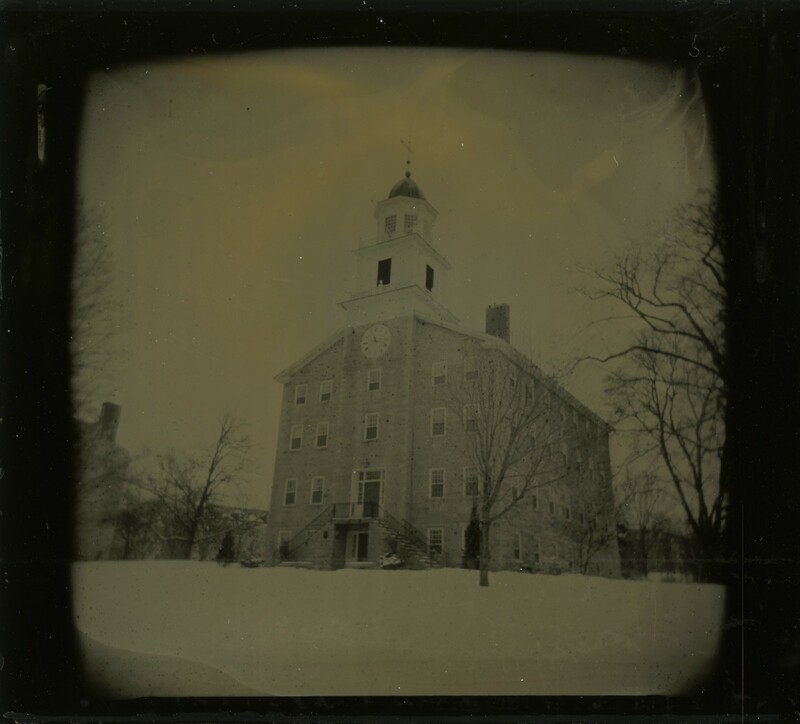 At the time, Middlebury had just celebrated its semicentennial but was troubled by dire finances, worrisome faculty turnover, and a burnt-out president. One hundred and sixty-five years later (a time with a notably brighter institutional outlook), I began an ongoing project to explore the technical intricacies and unique beauty of the tintype process while here at Middlebury. Photography was a major part of my creative upbringing and sense of family history; my great-grandmother’s stunning panoramas of the American West adorned the walls of my childhood home and film photography has been one of my main creative outlets since middle school. At the tail end of my first summer away from Middlebury, I took a workshop on the tintype process at the Kimball Art Center in Park City, Utah — a fitting echo of my mother’s experience in that same darkroom learning how to make cyanotypes in her early twenties. I was immediately hooked and began to plan a wet-plate developing setup here at Middlebury. 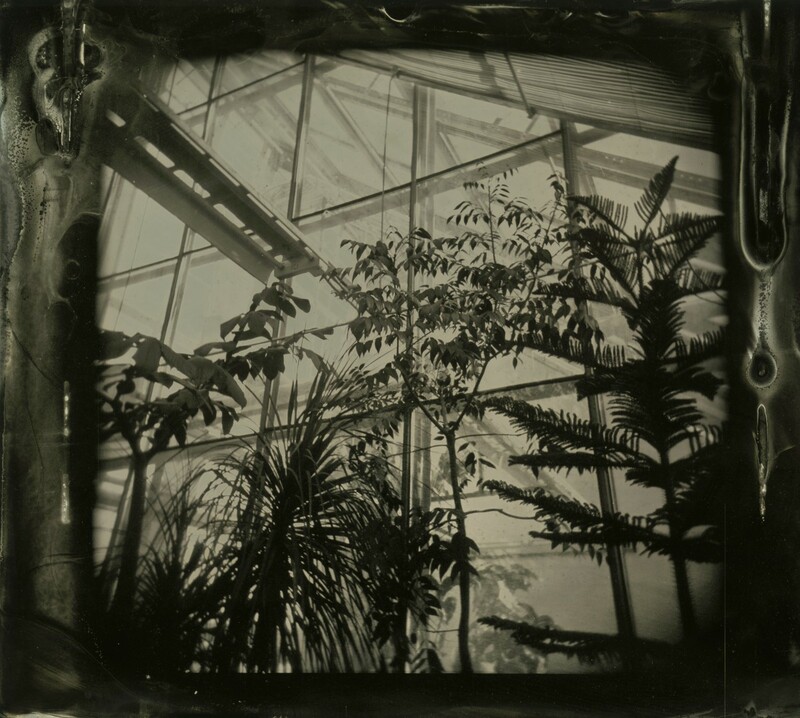 Thankfully, there was already a student-run darkroom in the Forest Hall basement that was supportive of the endeavor and after a few months of gathering materials, I was able to start putting collodion to plate during my February Break. Over the course of that week and a few ensuing weekends, I shot a total of 73 plates with my Holga, a simple plastic-lensed camera. Each plate measures 3.5 by 2.5 inches and is made of aluminum trophy metal with a black coating, which is the more affordable modern version of Japan-lacquered iron plates used in the 1800s. After carefully flowing a mixture of collodion and bromo-iodide salts onto the plates, they were sensitized in silver nitrate. 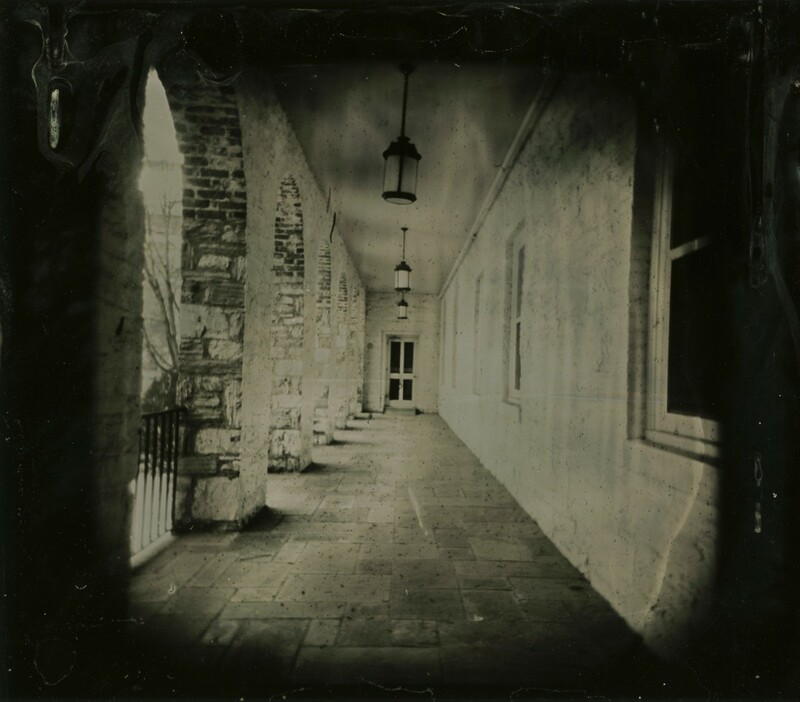 I then had about 15 minutes before the collodion dried, giving me just enough time to fast-walk across the freezing-cold campus to make a 5-15 second exposure. After developing and drying, the final step in the process was to coat each plate with a lavender oil-infused sandarac varnish; warming the plates and varnish over our electric range made my Gifford suite smell like lavender for days — to either the delight or chagrin of my suitemates. About half the plates depict scenes across campus, my favorite of which are those taken in the Bicentennial Hall greenhouse. The other half are portraits of friends who had just the right amount of curiosity and patience to bear with me as I got used to the process. 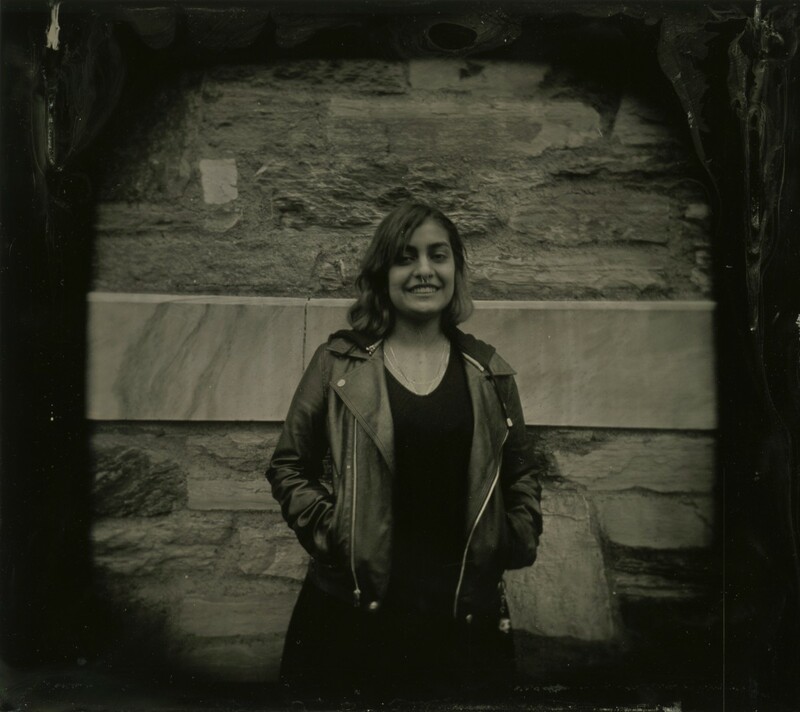 In the end, my exploration of the tintype proved to be just what I’d hoped: a humbling technical and artistic challenge and a tangible connection to the history of photography. Once armed with a better camera and larger plates, I hope to continue the project. This post should come as no surprise to our Stacks & Tracks listeners, as our theme for the first episode of the semester was our newly acquired peep shows! 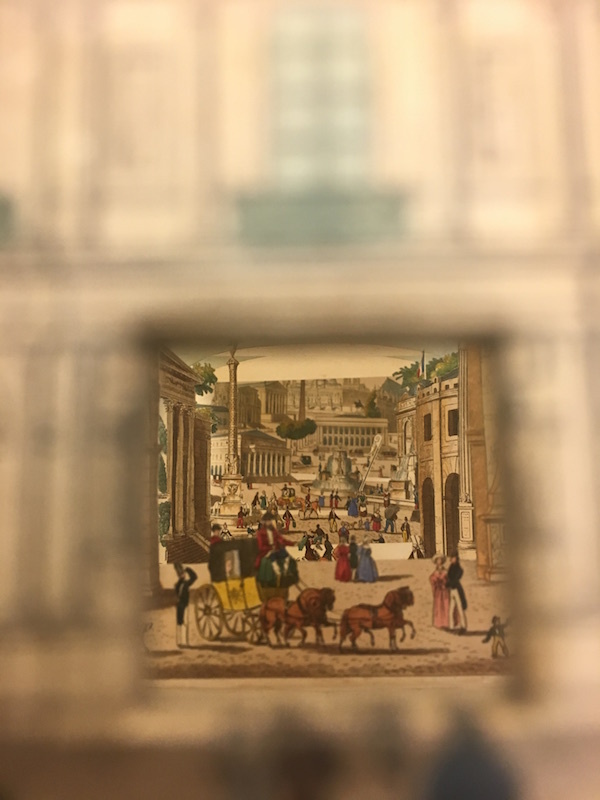 Peep shows burst onto the European scene in the early 19th century with Austrian printer Heinrich Friedrich Müller’s first “Teleorama” in 1825. 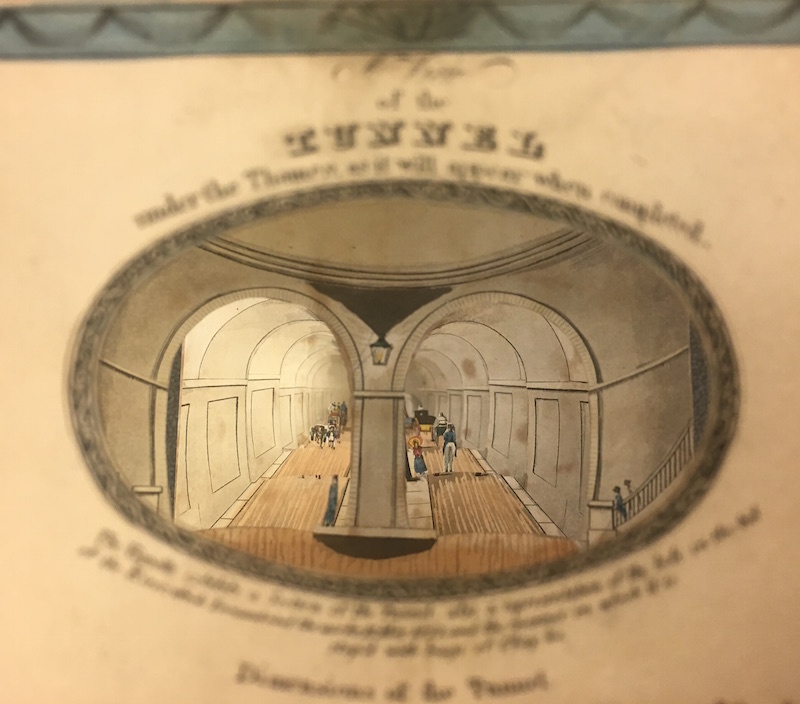 These tunnel viewers became immensely popular in Germany, Austria, France, and England, and we are now the proud custodians of examples from the latter two countries. 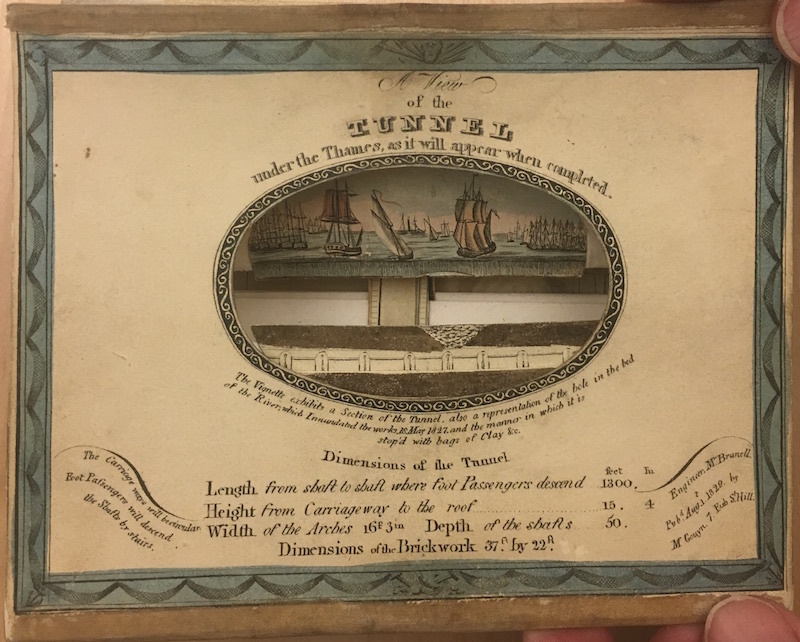 The first, “A view of the tunnel under the Thames as it will appear when completed,” depicts a projected view of the first tunnel under a river ever constructed. 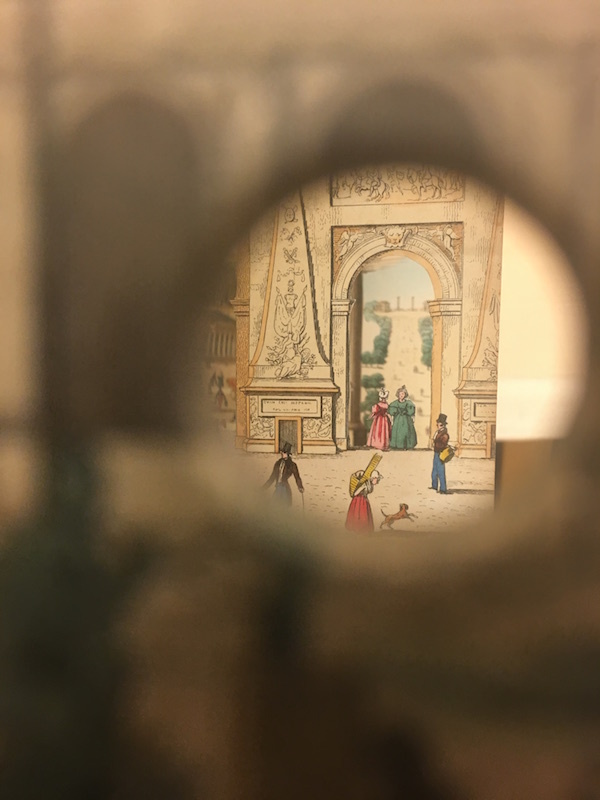 This peep show offered a glimpse into the future as it was printed in 1829, and the tunnel was not completed and opened to the public until 1843. The accordion structures unfold to display perspective views to captivate and entertain audiences. 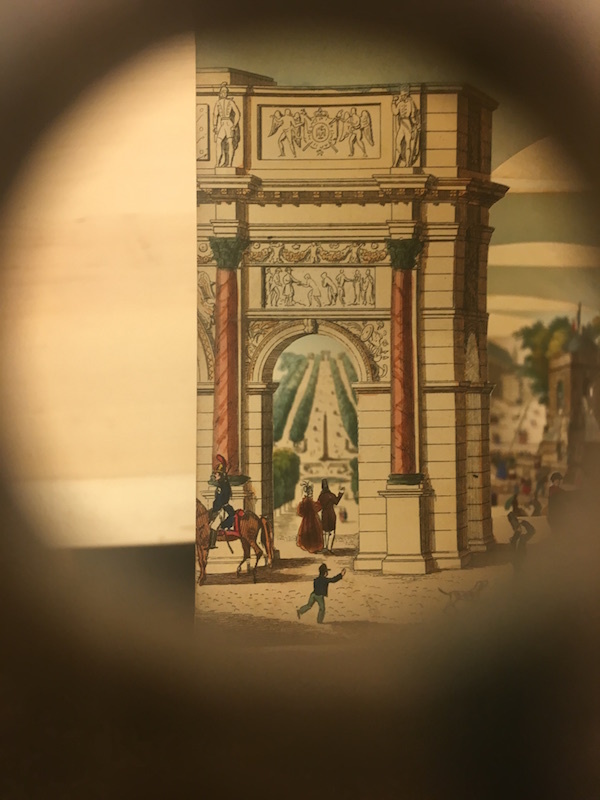 The second, a French peep show from around 1836 with the Les Tuileries Palace on the front features three viewing options. Through the center square we see pedestrians, carriages, and equestrians on the streets of Paris, with monuments and churches, fountains and buildings, representing the best of the city. 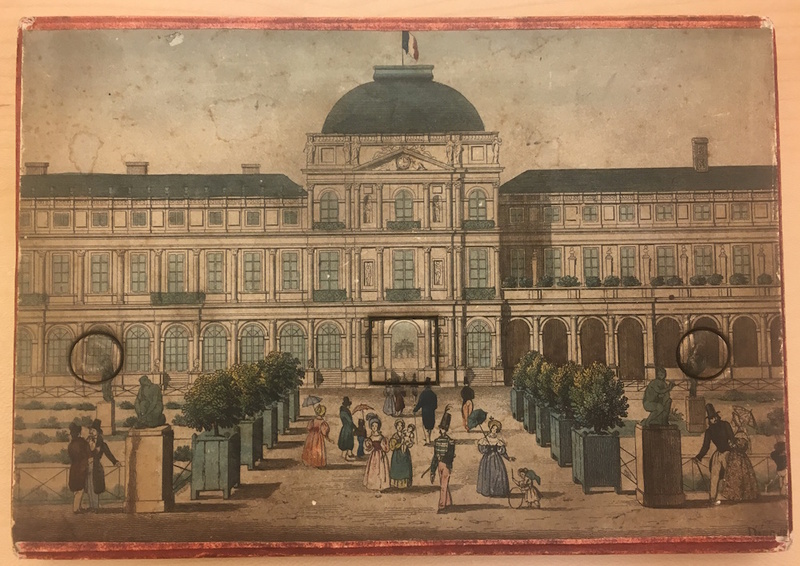 The left and right cutouts complete the picture with views of gardens. If you missed today’s show, be sure to listen to WRMC Wednesdays from noon to 1pm. And come peep these peep shows yourself in our reading room from 1-5 Monday through Friday.